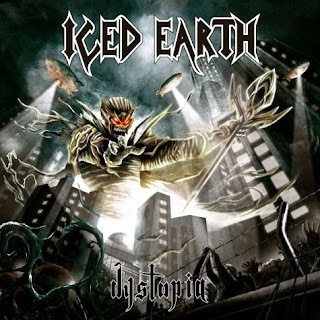 Take this as a confession: I never really got Iced Earth. For a Heavy Metal fan, that sounds like a heresy I guess. But as you all know, appreciation of music is completely subjective. 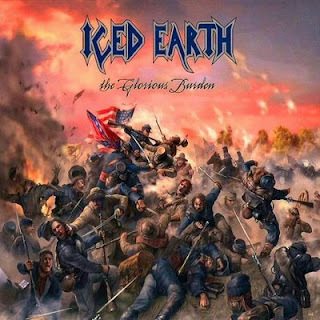 I really need to feel the music all over my guts to “get it”, and it just never was the case with Iced Earth. I still remember buying the normally amazing triple Live CD (Alive in Athens) when it came out back in ’99; everyone had told me it was the perfect introduction to the band, and I was so disappointed! I mean I did recognize the quality of their Heavy Metal, but somehow, I just didn’t dig that band… Maybe it was about the very old-fashioned vibe, the cheesy lyrics…I can’t really tell, to me, they sounded like a way too nostalgic band… I even remember a discussion with a friend of mine about The Glorious Burden record; that came out in ’04. Man the lyrics were just…ARGH! And now here I am, listening to Dystopia on a nice 180g-vinyl and thinking, WOW, at last I get this band! Something's changed, definitely, and knowing what I just confessed, you guys should realize how awesome this record is. Freakin' awesome, nothing else to say about Dystopia! 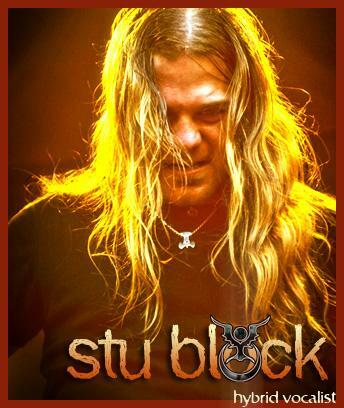 First very cool thing about Dystopia: singer Stu Block, former Into Eternity (a band I literally LOVE). The guy is the perfect modern heavy Metal singer. He’s got the insane high-pitched powerful voice and the aggressive modern singing. That is clearly an asset for Iced Earth and it makes the songs sound much less old-fashioned. And I also felt that mastermind Jon Schaffer specifically wrote songs that would allow Stu to express his entire potential. The songs on Dystopia are extremely heavy, with insane power riffs and amazing choruses. In fact, every song has 3 special ingredients: at least one insane riff, a fantastic chorus and a cool solo or melodic bridge. And somehow, the “cheesy” feeling you had when listening to Iced Earth is replaced with a very impressive modern approach! It’s like old Iced Earth met Nevermore, the melodies and the songwriting join forces with the heaviness of Thrash-like riffing. It’s amazing sometimes how minor changes in a band completely reverse the feeling you get out of the music! That is the killer self-titled opener! Dystopia’s got 10 awesome songs, but some of them stand out, like the killer self-titled opener, the genuine hymn “Anthem”, the melodic “Anguish Of Youth” and my personal favorite, “Dark City”. And although some tracks are just “good” (like the very classic “V”), this is still overall a "way above average" Heavy Metal release. One of 2011's best songs. Period. Iced Earth Cheesy? Maybe in your world.